A recent article in The Wall Street Journal raised an issue most of us dance daily: navigating privacy amid the inevitability of neighbors, in this case the occupants of single-family houses in tract developments. We all want both: the sanctuary of privacy with enough community to not feel vulnerable. In other words, how does one design for civitas? As I read the article, I began to look for something I didn’t find: curiously, the piece turned out to be blind to the fact that this quest for equilibrium is a classic architectural problem, one passionately discussed and endlessly investigated as a delicious challenge. What could have been a discussion on what architectural strategies actually work on behalf of privacy was actually a one-note issue, embodied by its title. “Close-Together Houses Spur Lots of Gripes” focuses on lot sizes and setbacks (how far a property is “set back” from the property’s front, rear, or side property lines) between houses. While front setbacks for such houses are usually fairly deep, say 25 feet or whatever is prevailing along a given street, side setbacks are typically where the action is in terms of potential conflict. “With just 20 feet” between one pair of houses, for example, one man complained that when he was working on his computer he could also enjoy a fine view of his neighbor’s dining room. Another homeowner was dismayed to discover that her neighbor’s second story window view included a view of her pool (and, of course, related activities around it.) A third homeowner described how awkward she felt when she was washing her dishes and saw and her neighbor was doing the same chore 17 feet away. Perhaps seeing another person doing the same mundane task reminds us of “Little Boxes” and how boringly similar we white Americans are in some ways … but more likely, if someone can see me washing dishes, what else can they see? The article blames this suburban middle-class tension on two factors: the size of the house, and the size of the lot on which the house sits. It is true that the American home has increased 28% since the late 1940s and early 1950s, when the median size of houses was about 900 to 1,200, to today’s roughly 2,500 square feet. Meanwhile, the size of a lot has decreased 12% to about 8,750 square feet (about 1/5 of an acre.) But these changes are really just a red herring. Design, not distance, is the issue. Not once does the article address the role of fenestration, or how it might have easily been changed to avoid gratuitous confrontation, however mild. No one wants to do the visual equivalent of “excuse me” all the time. Why would the developer’s architect not have fun with such a fundamental issue? Locations of windows and doors could be nudged, diaphanous exterior screens employed, clerestories (windows well above head height) used, or skylights, among any number of creative solutions. At my house, I had all the lower sashes of the kitchen double-hung windows facing my neighbors’ rather cluttered side yard sandblasted so they are translucent, not transparent. They can see the top of my head, but not more interesting features below. In one key window, I placed a mirror in the upper sash, reflecting a large tree in my back yard rather than their refrigerator. When I designed a second floor for them, I made sure that their upper windows had no sightlines to my bedroom, although for them, the windows were perfectly placed to provide light where they needed it at a stair landing. In the rest of my house, “roman” blinds roll from the bottom up, giving me views of the San Gabriel Mountains; moving clouds and sky; and the Engelmann oak trees in my front yard (in contrast to the Coast Live Oak, the Engelmann’s diaphanous branching and ‘self-pruning’ ability adds an element of crisply efficient bio-functionalism in the face of wind loads, an evolved bit of smarts that makes their majestic dignity all the more amazing.) Collectively, all these views are important to us as animals who need to be alert to changes in our environment. So many brilliant architects have already provided roadmaps balancing community and privacy. If one considers, for example, the 1920s and early ’30s European Siedlungen (government sponsored housing) developments in Germany and Austria by architects such as Adolf Loos, Walter Gropius, Ernst May, Mies van der Rohe, and Bruno Taut; Neave Brown’s Great Alexandra Road housing in Swiss Cottage, London, 1968 for the ambitious Greater London Council; Frank Lloyd Wright’s 1930s and early ’40s four-plexes centered around a courtyard (which inspired the founders of the famous postwar Crestwood Hills district, designed by A. Quincy Jones and Whitney Smith); or R.M. Schindler’s tightly knit Falk Apartments in Los Angeles, four flats fitted into a steep triangular site formed where two busy streets converge. Schindler’s daredevil geometries and clear facility with mentor Adolf Loos’s concept of Raumplan (in which varying room heights and sizes animate a space), not only fit on the site, which is an amazing accomplishment in its own right. Schindler also gave each resident unique views and richly textured, dynamic interior and exterior spaces. No cookie cutter here. 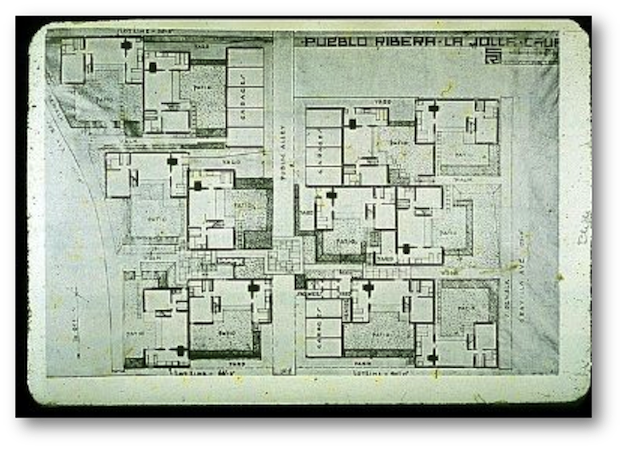 Also by Schindler, the 12-unit Pueblo Ribera, 1923, La Jolla, is a less custom development in that many of the units have identical footprints. Its plan is an instant lesson in creating privacy: simply rotate the units around shared walls. One might also look at Richard Neutra’s Strathmore Apartments, 1937, or his Silverlake Colony of ten single-family houses overlooking the Silverlake Reservoir in northeast Los Angeles. Developed over two decades from the late 1940s to the early ‘60s, here Neutra tailored his architectural vocabulary to each client. Each house shares some features, finishes, and materials – weaving a clear identity to the group – but is also distinct, with individual views and its own specific relationship to the street, the reservoir, and the hills beyond. Each also alertly responds to the very intense human need for privacy. 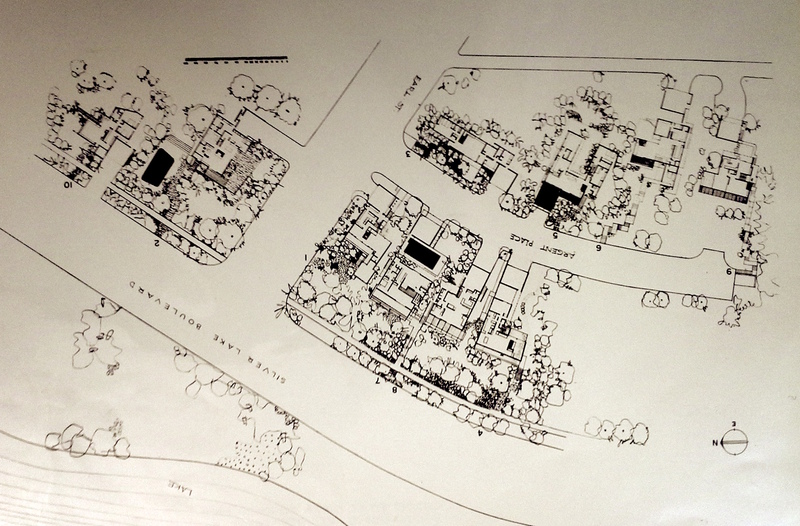 Neutra did not force community. 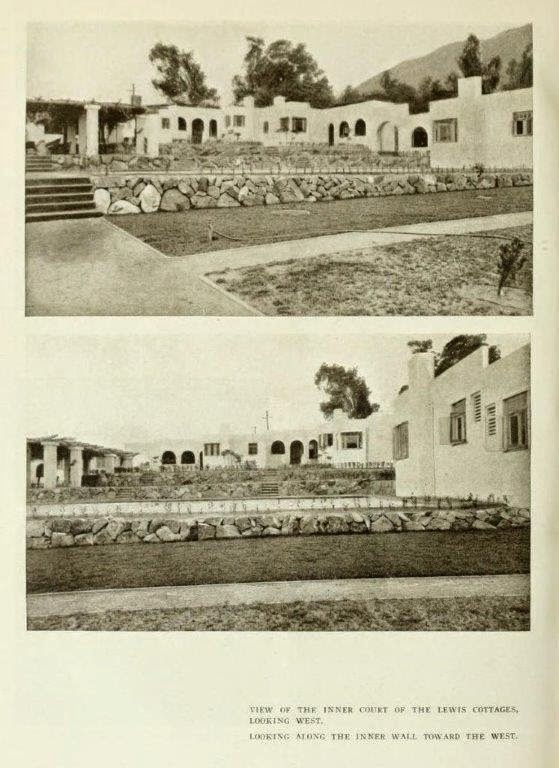 Irving Gill’s Lewis Courts, Sierra Madre, 1909, is one of the finest solutions to privacy and community I know. Gill took a large square site, and basically drew two perpendicular lines on its plan, diving the site into four equal quadrants with major walkways assuming the role of the lines. 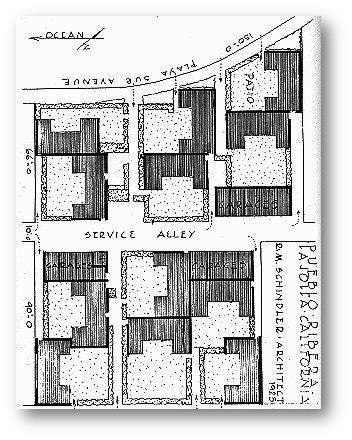 He then placed a ribbon of very small connected houses along the site’s perimeter. The ribbon takes up about 1/3 of the parcel – try talking a developer into that today! Gill allotted the rest of the site to gardens, with a central public garden surrounding an roofed, open-walled gathering space. This principal Beaux-Arts layout gives way to secondary just-big-enough private gardens of varying shapes and more informal paths that lead to each unit, creating a hierarchy of desired involvement with others: ways to see and be seen. Gill gives you choices; in the language of environmental psychology, he set up a broad range of affordances in a disciplined way that acknowledges basic human traits. Likewise, the continuous ribbon of units is not static. While governed by Gill’s severely limited, gracious palette of simple shapes and surface finishes, nonetheless the little volumes variously step back and project. Heights change, too, along with window configurations. Key to the composition is the site’s location, just below the San Gabriels. Tracking the rising slope, Gill introduced terraces that break a potentially static Beaux Arts parti in section, animating the Courts and providing a stronger identity to the units associated with each elevation. While the central space has been in-filled with some later additional houses, effectively destroying Gill’s vision (as well as undermining the spatial quality and serenity he delivered to the inhabitants with such generosity) the project remains a pretty damn flawless template for contemporary living, especially if you want to live in a small space as do so many baby-boomers and millenials.